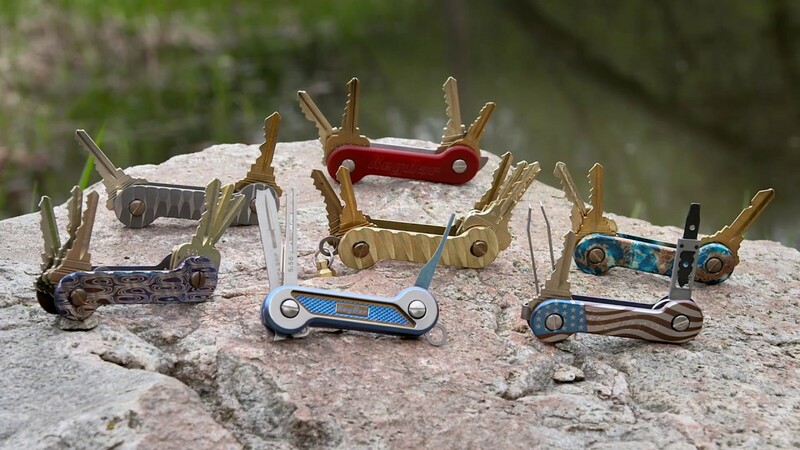 KeyBar is a patented USA made key organizer. It works like a multi-tool for your keys. KeyBar is a solution to wild and disorganized keys that are difficult to manage and make a lot of noise. A KeyBar will stop the noise, kill the clutter and consolidate your keys. Just organize and load your keys just as you want them. You can also add our designed-to-fit tool inserts! KeyBars are made out of premium materials such as aluminum, titanium, carbon fiber, even brass and copper, as well as a variety of cool designs and finishes. Each KeyBar includes a titanium pocket clip and titanium key fob link plus three screw lengths that accommodate up to 12 keys or accessories. Need to include more than that? Get one of our extension screw sets that will accommodate up to 28 keys or accessories! Thanks to KeyBar, noisy key rings are a thing of the past. Stop the Noise!